I decided to breastfeed my son for the health benefits, but what began as an intellectual decision quickly became an emotional journey as I bonded with my child through the simple act of feeding him. Breastfeeding was the solace of those hectic first weeks of his life; when I needed a reprieve from the frequent visitors, I would take him into another room where it was quiet and we could be alone for a few moments while he nursed. Those same quiet moments in the middle of the night made all the fractured sleep worthwhile. Overwhelmed and exhausted, breastfeeding forced me to stop, sit down, hold my child in my arms and just enjoy him. 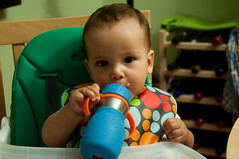 But as his first birthday approaches, I find myself wrestling with the issue of weaning. When to do it? How to do it? How will I know when and how to do it? I’ve read a little bit about the process. As a baby’s solid food intake increases, a natural weaning process begins because the baby no longer needs as many calories from breast milk. That being said, babies still get some of their nutrition from breast milk or formula until one year of age, when they can be weaned onto whole milk–though there are sources out there that encourage mothers to breastfeed at least a few times a day for as long as possible (up to 5 years). I knew I would never be the kind of mother to fall into the latter category. I always said I wanted to stop breastfeeding before Z was old enough to unhook the nursing bra himself, but I planned to nurse him until he was at least a year old. Once I returned to work I still planned to nurse in the morning and evening until it felt like the “right time” to eliminate breastfeeding altogether. Because of that belief, it has been very difficult and emotional for me to admit that the time to wean my son may have arrived sooner than I expected. Probably the first sign that weaning time was approaching was Zayden’s decreased interest in nursing. It has been months since I’ve thought of breastfeeding my son as a special time that we share together. The cuddly infant who used to relax and nuzzle at my breast is long gone. Even in a quiet room without distractions, he no longer settles at the breast. He pulls off repeatedly, often trying to sit up or crawl away throughout the feeding, but if I mistake one of these escape attempts for a signal that he is all done before he is actually finished, he’ll cry. It makes for a very confusing and frustrating process. I have also had several signs that my milk supply is not what it used to be. I have not felt engorged in months–even when I miss a feed. I can no longer pump sufficient milk to leave him a bottle when we go out for the evening. At one time, I could pump 4-6 oz. of milk in a 20 minute pumping session. Now I get less than an ounce in the same amount of time. We’ve resorted to using formula when we leave Zayden with a sitter. But the clearest sign came when I had to start supplementing some of my breastfeeding sessions with formula. It doesn’t happen every day, but sometimes I feel like I don’t have any milk left, and I can no longer hear him swallowing, but he will keep pulling off the breast and crying in frustration before trying to nurse some more. The first time this happened, I decided to offer him some of the formula we had on hand for babysitters, and he gulped down 6 ounces! So far I’ve only had to supplement a handful of feedings, but the need to supplement has become a more frequent occurence. The final push to start weaning came when I got sick recently. I’m guessing it was a case of the flu (fever, muscle aches, sore throat, total lack of energy, etc.). Whatever it was, I spent most of the Thanksgiving long weekend in bed feeling miserable. To help me get extra sleep, my husband got up in the wee morning hours with our teething son and gave him a bottle of formula instead of waking me for his 5am feeding. 5 days in to this morning bottle routine, I feel like I should just accept that this is the first breastfeeding session that he’s dropped and that instead of trying to go back and rebuild my already dwindling milk supply, I should just continue down this path that I’ve been trying to avoid. Admitting that my baby no longer needs my milk the way he once did is hard. Weaning my son means leaving that special bond from his baby days behind and watching him take one more step towards independence. I wasn’t ready to take those steps, that’s for sure! I guess because I don’t have to go back to work, I’ve always taken steps to try to bring him back to the breast. So far he always returns, though for sure it’s not what it used to be. I think if I didn’t nurse him before naps that he would be weaning. That said, Aiden has been ‘increasing’ his morning feed in the last month. He kind of returned to enjoying it, I think. Learn more about advertising options here.